Corinna Bechko hasn't reinvented the 'Aliens' mythos, she's integrated Vampirella in that world seamlessly and crafted an exciting sci-fi story worthy of the franchise. I can't help but gush at the quality of the writing and art of Javier Garcia-Miranda.The classic survivor's tale of xenomorphs run amok while leaving a trail of bodies in their wake is always a treat when done right. And what Bechko and Garcia-Miranda have done is beyond just right it's nearly flawless. As a reviewer, it's tough to contain enthusiasm and affection for a book in order to try and keep an objective perspective. However, my enthusiasm is justified when a title surprises you and is executed with such respect to the history of each property. Bechko has noted her love of the 'Alien' franchise and it shows. 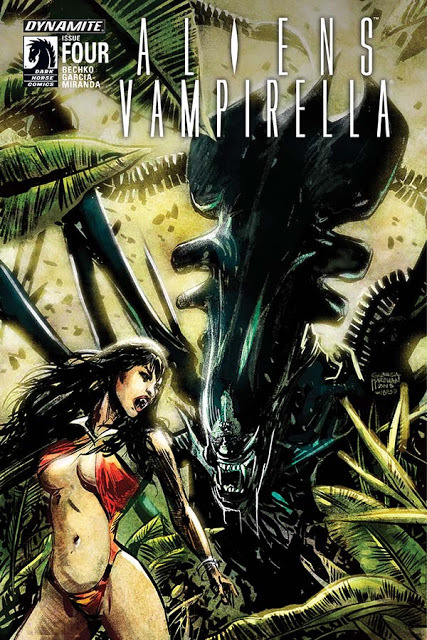 Unlike some comic book stories in the past, 'Aliens/Vampirella' is foremost an 'Aliens' tale in its world and Vampirella is visiting. What that does is keep the tension, suspense and horror associated with big bloodthirsty xenomorphs intact. Tucker's plan to gas the lower base to eliminate the threat of the monsters they saw and sacrifice Lars and Vampirella in the process has only driven them to the surface. The tense chase underground forces Vampirella to fly up through a path created by other xenomorphs. It leads to a confrontation that injures Vampirella's wing and now she and Lars continue to evade certain death with every turn. At least Lars was able to communicate with his wife Sarah to stay away from the base and not land under the circumstances. Will she listen? Science fiction history says no. The maze-like labyrinth of the old base created a suspenseful claustrophobic atmosphere and now as they reach another level in this cat-and-mouse game of death it seems the wide open spaces are just as dangerous. Garcia-Miranda has done an incredible job with the pencils as everything is beautifully rendered but especially character designs but none better than the xenomorphs. They're as frightening and imposing as you'd expect. And Inlight Studios' colors give them the dark and glossy treatment they deserve. 'Aliens/Vampirella' #4 continues to thrill as Lars and Vampirella struggle to survive as the xenomorphs track them down. Bechko and Garcia-Miranda are doing what many have failed to do in bringing two properties together that actually work in unison. Seeing the queen infused with Vampirella's power is going to make the next issue an exhilarating penultimate edition. I can't recommend this series enough.